Amsterdam Round 2 | Albatroz & Co.
My trip to Amsterdam with a friend back in November was actually quite lovely. The first time I went to Amsterdam it was more as a time to spend with the people I was with and didn't really see much of the city. This time by the end of our few days, we were navigating the city like Google map pros. We stayed in Clinknoord Hostel. 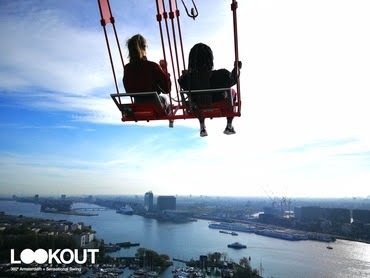 I would 100% be looking to book it again when I go back to Amsterdam, if I am not couchsurfing. My friend and I were in a female dorm of four and paid €35 for the three nights spent there. There are communal bathrooms but they are quite snazzy and very clean. The staff are also really lovely. There's a place to leave your things before or after check in. Additionally there are many hostel hosted events so plenty of opportunities to meet other travelers. The communal space is also very inviting with great music, games, a bar, books and an enclosed open rough area for doing some yoga or watching the stars. If you forget things like towels and toothbrushes, they sell them too but they're a tad expensive. Location wise, you cannot get any luckier. The hostel is located less than a five minute walk from the ferry port where a three minute ferry ride (which is not only frequent but also free ) will take you directly to Amsterdam Central. So you are essentially eight minutes from the heart of Amsterdam and thus everything you could possibly want to do. On this trip I really wanted to sample the Amsterdam tourist scene and my mate also wanted to sample a bit of the night scene so we did just that. On our first day in Amsterdam, we met an old friend of mine living there and got to explore the 'hipster' scene in De Pipj. It is apparently the 'It' place in Amsterdam. We enjoyed a lovely Nepalese food in Surya. I'm planning on having a meal there at least once every time I am in Amsterdam. The most hipster place we visited in De Pipj was called Coffee and Coconut. Truly a beautiful interior, it used to be an old cinema building and now houses a rage of people eating leaves and drinking out of coconuts in freezing November. It's an Instagram picture den and has prices to match too. We went here twice for lunch and I would heartily recommend the Beef Burger. We also visited my Aunt and Uncle after trying to get tickets to Rainbow Kitten Surprise. We failed in that mission but while walking away completely dejected, who do we run into?? The one and only Charlie Holt! I didn't take a picture with them because he was eating a waffle, in a rush and I was just fangirling too much. Definitely made my evening better. My friend wanted to visit the Rembrandt museum. I say I'm not one for museums but I almost always enjoy every museum I visit. This one was no exception. In one of the rooms, I got to watch one of the tour guides make paint and even got to try it. On one of the evenings we ventured out into the city to try and find a club. Unfortunately for us, it was a Sunday evening so selection was not great. We did however end up in a quaint jazz bar where we got to enjoy some live music, sing happy birthday to some random old and enjoy some rather nice pints. Another great feature of the hostel is that it is right next to the A'dam swing. We did this on our last day as it meant we didn't have to go too far. I seem to forget my slight fear of heights when I'm planning things sometimes. I screamed all the way through this safe swing but sure look. I might've looked and sounded silly in the moment but I really enjoyed it too. Altogether, it was a very different trip to my first Dam trip but equally as fun and enjoyable. I'm looking forward to the next trip already. Perhaps some weekend to come. I'll also make sure to take a lot more pictures. This trip was immensely video footage heavy and with exams aroud the corner, I don't go the tme to edit it all together. I'll have to put it on my summer pojects list. Have you been to Dam recently ro planning on gogin? What's a place or activity you'd recommend? Let me know in the comments.